There’s something irresistible about the flavour of farm-fresh vegetables that have been cooked on a grill. The natural sweetness of the veggies seems somehow enhanced by this method, and the slight smoky notes offer a lovely counterpoint. When I first made this salad I thought that perhaps its rather plain appearance might be an indicator of its taste – I couldn’t have been more wrong. The slightly spicy lime dressing is the perfect accompaniment to the trio of grilled vegetables. It is an ideal side dish for all sorts of menus, whether your guests are omnivores, vegetarians or vegans – plus it’s gluten free! Make lots, because everyone will want seconds. And maybe thirds. Grilling the vegetables for this salad preserves a lot of their flavour and texture that might be lost with other cooking methods. Preheat barbeque to medium-hot (about 375 – 400F if your grill’s thermometer works). Shuck corn and remove as much silk as possible. Cut zucchini and carrots lengthwise and brush both sides with the 1 tablespoon of olive oil. Sprinkle with salt and pepper. When barbeque is hot, place corn cobs directly on the grill and cook for about 20 minutes, turning often. The goal is to have tender kernels with only a few grill marks. 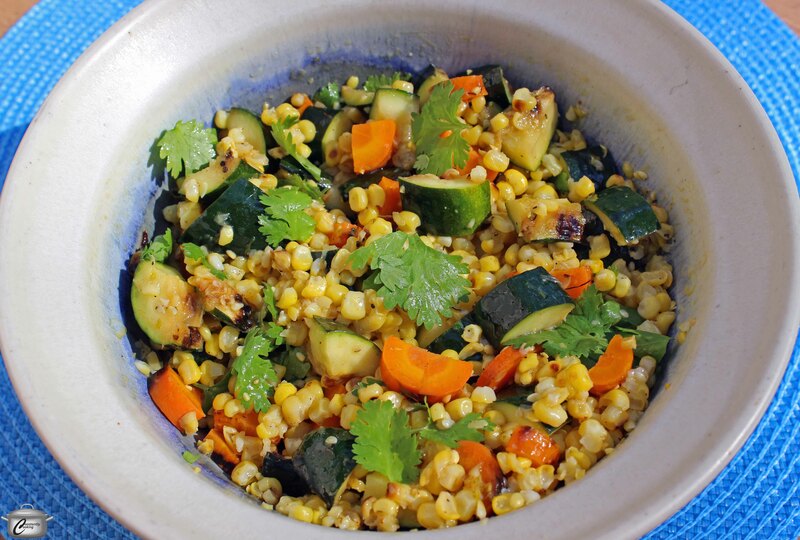 While corn is cooking, place zucchini and corn halves directly on the grill. For zucchini, grill about 5 minutes on each side, until it is tender and has nice grill marks. Do the same for the carrots (they may need a few extra minutes). Remove all vegetables when cooked and let cool. Slice each half-circle shaped strip of cooked zucchini lengthwise down the middle, creating two long quarter-circle shaped lengths. Chop cooled zucchini and carrots into 1/2 inch slices pieces. Use a sharp knife (or a corn stripper) to remove kernels from cobs. Mix all vegetables in a medium bowl. For the dressing, combine lime zest and juice, vinegar, chili powder and 1/4 cup olive oil in a jar with a tight fitting lid and shake vigorously until well blended. Pour dressing over vegetables and toss to combine. Taste salad and add salt and pepper as needed. Add cilantro at serving time and toss salad once more. Serve immediately at room temperature or refrigerate salad until chilled. Serves 6 – 8 as a side dish. This entry was posted in Salads, Uncategorized, Vegetables and tagged apple cider vinegar, carrot, cilantro, corn, gluten-free, grilled, lime, salad, vegan, vegetables, vegetarian, zucchini. Bookmark the permalink.